Soccer stars with reach. 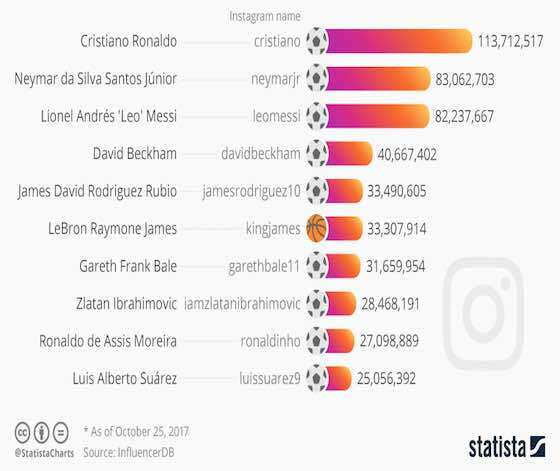 This chart shows the Instagram accounts of sports stars with the most followers. French soccer club Paris Saint Germain smashed the world transfer fee record, buying Neymar Jr. from FC Barcelona for a stupendously expensive 222 million Euros. The previous record, set last season when Manchester United bought midfielder Paul Pogba from Juventus, was an already astronomical 105 million Euros. How can a deal like this come about? The answer is release clauses. It is reasonably common practice for players, not just the elite, to have a clause in their contract which would force the club to sell if triggered. Neymar's is 222 million euros. While this is an obscene amount of money, it is by no means the highest release clause. Real Madrid and Portugal megastar Cristiano Ronaldo reportedly has a clause in his contract set at 1 billion euros. Soccer: "Instagram's Biggest Sports Stars"